When it comes to style, it's tough to beat actor Ranveer Singh. He has a quirky sense of fashion. (And, we all know that). He has experimented and redefined his look, style several times and his whacky outfit, accessories and different hairstyles, have made Ranveer a Bollywood style icon, but thoda hatke. At the Filmfare Awards 2018, Ranveer wore his heart out (quite literally). He stole the thunder in a printed suit. (There's more to it.) 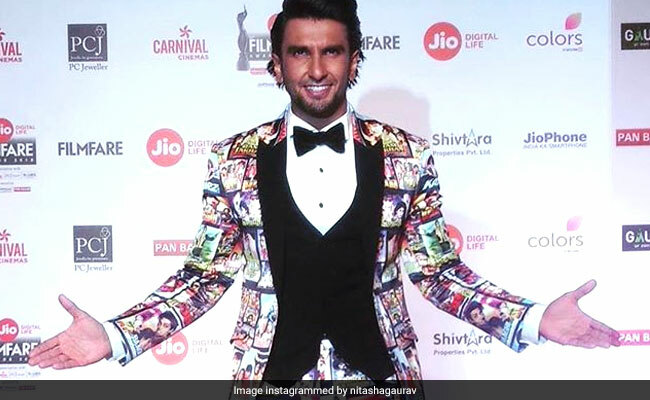 Ranveer's suit had poster motifs of his favourite films such as Ajooba, Deewar, Ram Lakhan, Baazigar, Ghayal, Aankhen, Vastav and several others. Here's Ranveer Singh for you. And this is how Ranveer 'rocked royalty.' We just cannot take our eyes off Ranveer and Bappi Lahiri, who received the Filmfare Lifetime Achievement Award. "At the movies.... quite literally! As you tell, those are movie posters printed on the suit. You can spot Baazigar, Ajooba, Mard, Gambler, Ghayal, Amar Akbar Anthony among other cult films from the 80s and 90s. It's a suit that makes you stare, giggle and have plenty of 'ohhhh yeaaah that one!' moments! #RanveerSingh in a very special custom-made #KarrtikD suit #Louboutin for the #JioFilmfareAwards. #OnlyHeCan," reads the description about Ranveer's 'filmy' suit on his stylist Nitasha Gaurav's Instagram page. News agency IANS reports that when host Shah Rukh Khan asked Ranveer about his costume, he replied, "People eat movies, drink movies, I even wear movies." Ranveer Singh also performed at the Filmfare Awards, held in Mumbai on Saturday night. Ranveer Singh's Padmaavat opens this week.